A good swing starts with the proper grip. A good grip is one of the most basic elements of a fundamentally sound golf swing. Your grip plays a much greater role than just helping you hold onto the club. It helps you maximize clubhead speed--which supplies power and distance on your shots--by enabling your hands to work together as a unit. The position of your hands on the club also affects the flight of the ball. Sometimes when golfers change from an unorthodox grip to the proper one, it doesn’t feel comfortable. They are used to the old--wrong--way they gripped the club. Keep a club in the house and practice gripping the club several times a day, a few minutes at a time. The new grip will soon feel just as comfortable as the old one did. If your grip is correct, when you look down you will see two “Vs” formed by the thumb and index fingers of each hand. You want to hold the club primarily with the last three fingers of your left hand and the middle and ring fingers of your right hand. Holding the club too much in the palms of your hands prevents you from having the desired mobility in your wrists. 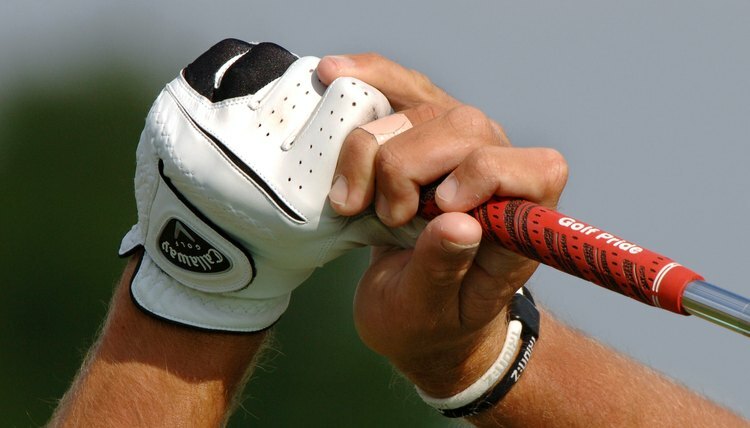 The thumb of your right hand does not play a major role in the grip. It is just along for the ride. You grip is your friend when it comes to helping you cure a chronic slice or hook. If you are slicing, try switching to a strong grip, which means turning the Vs slightly to the right. This will promote more of a right to left ball flight, and the “banana ball” you’ve been hitting will be a thing of the past. To stop a case of the duck hooks, do the opposite. Turn the Vs more to the left, which instructors call a weak grip. This will keep you from turning your hands over so quickly at impact, which causes the hook. With a correct grip the left wrist is cupped or hinged rather than forming a straight line up your forearm. You know your left hand is aligned properly on the club if you look down and can see two or three knuckles. This is good overall advice for golfers--relax and enjoy the game more. But with the grip specifically, lightening up means making sure you hold the club lightly. The pros on the PGA Tour make sure they don’t put a stranglehold on the club. They know a tight grip results in muscle tightness, a restricted swing and less power. Major championship winner Fred Couples grips so lightly that his right hand sometimes comes slightly off the club after he strikes the ball.